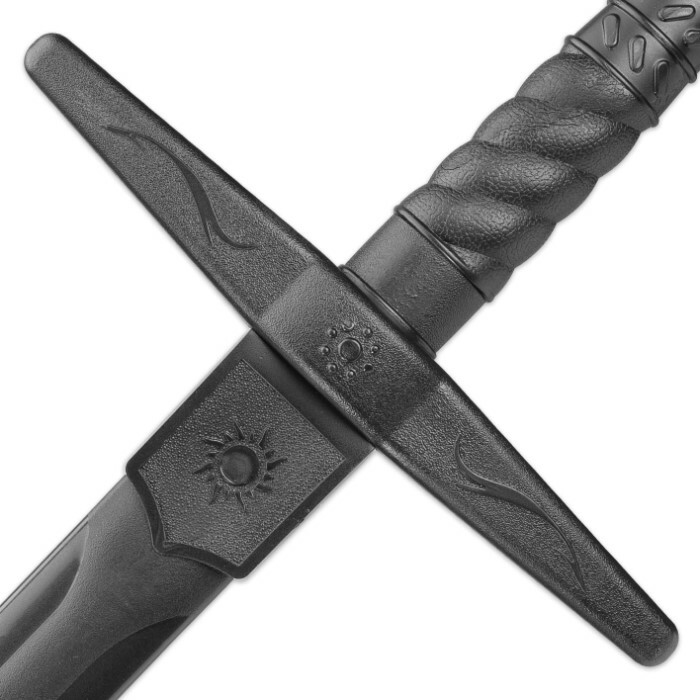 Polypropylene Middle Ages Sword | BUDK.com - Knives & Swords At The Lowest Prices! Received my sword today and oh my god it's amazing, I put it through a fight with a dulled Scottish claymore (do t ask) and it warped the claymore a little, it is indestructible and well worth the purchase, though I would recommend the cold steel version, I love this sword. It came bent words the tip and I keep bending it back, but keeps going back to its original shape, all in all it Awsome. Soon after receiving this, I found that it was near indestructible. It went through a fight with a bamboo staff (don't ask) and broke the staff. It will bend, but always returns to its original shape... which is the problem. My sword came bent toward the tip, and after several remedies, it remains so. We even put a board covering the blade, heated the blade up with a hair dryer, and put four hefty reams of paper on the board. We left it from about 8:30 at night to 4:30 in the afternoon of the following day. It's still bent. This sword is amazing! It arrived 2 days early. As it came out of the box it was glorious and came in 2 pieces the sword and cross-guard. 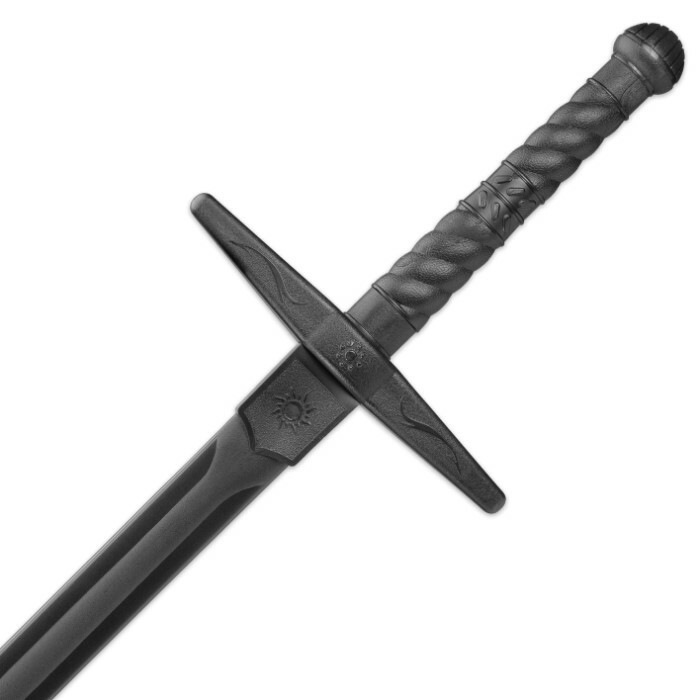 This sword is actually lighter than a sword of the same size made of steel but well worth the price. This sword will last forever and it is so tough. If you want to use it for show or for practice this is the sword for you! If used for practice then use some sort of protection, especially really tough gloves. This sword can really hurt someone otherwise. Definitely worth it. Thanks for the tough training sword, it's perfect for the weight and the practice. Nice designs on the sword, they make it look a tad more real than just a plain practice sword. Well, first off True Swords, as always, impresses with the speed of the shipping. However, I was not too impressed with the product. There was a choice btw this one and the Cold Steele versions of this. While this one was a little cheaper, and I thought it looked cooler, I'm not sure about the quality. The "blade" is warped- it cruves to one side- and it is just obvious enough that once you notice it, You ALWAYS notice it. Also seems very bendy, more so than I expected for a synthetic. Overall its alright, but I might look into another brand if I get another one. My favorite of several swords I ordered. I have gotten great use out of it. Great against my other ones that I ordered! Barely any damage to it! Once again, an awesome order from Trueswords! !